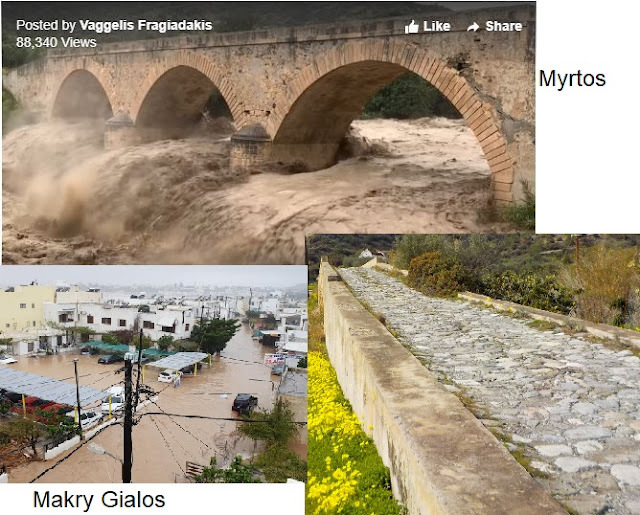 I love the Autumn in Crete: it arrives after the first rains like a second Spring, as though the earth has been held back, tense and waiting for the life giving water from the sky. Those reviving droplets arrived down here on the 17th of the month, just a few of them and one day later than last year, but at the weekend we had a full 17mm and already Peristeras Common is wearing a faint cloak of green. There is a hint of magic in the air as cumulus clouds hang over the sea. Let’s take a little walk up into the hills and see what we can find. Now this is an interesting little plant. 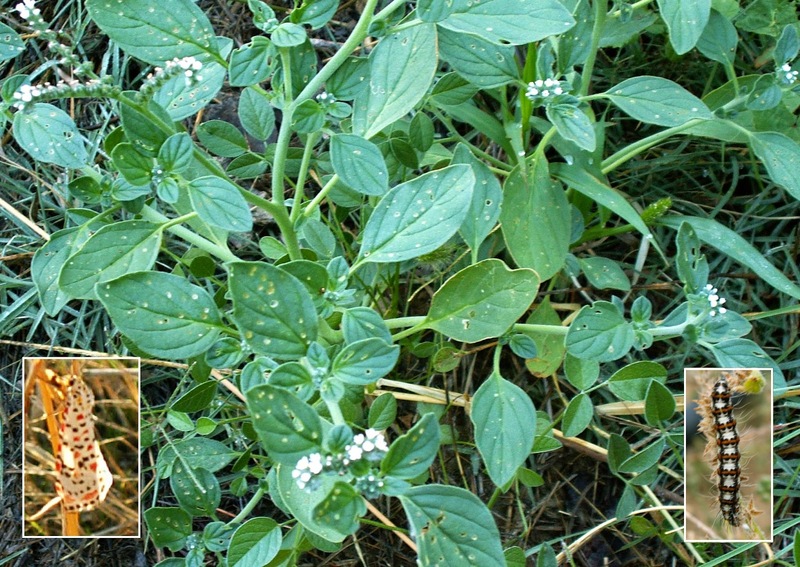 It’s the European Heliotrope or Turnsole (both words mean turning to the sun). It’s a poisonous little beastie, to grazing animals at least, as it contains pyrrolizidine alkaloids. A horse that compulsively walks may have eaten this but locally it is the preferred nursery for the beautiful Crimson-speckled moth who’s caterpillars should be appearing next month. Here the leaves are playing host to a rust fungus, Uromyces heliotrope I think, which accounts for the little yellow pock marks. Once again we see three kingdoms in one location: plant, animal and fungus. Fascinating how everything works together. We’ll continue on up to the patch of disturbed ground which I first introduced you to back in January in the blog entitled When Nature Fights Back. The clumps of tussock grass are still summer browned but the greens are beginning to show through, the narrow-leaved Asters are chest high and the Tamarisk trees have built an almost impenetrable wall across the centre. You’ll notice as we scuff our way through the grass little flashes of orange or blue suddenly popping off like little fireworks. These are grasshoppers, specifically the somewhat obviously named Red-winged and Blue-winged. As you can see they are superbly camouflaged against the arid brown soil when they are at rest and only give themselves away when they move and show their brightly coloured hindwings. Now you know me by now, I’m never one to pass up free food so I’m going to introduce to a the tree that you always dreamt of as a child: the one that gave scrummy chocolates rather than boring old fruit but on the way I see that the figs are ripening so I’ll just have a few of those. Anyone know a recipe for fig and chocolate pudding? Ah, here we are, the chocolate tree. 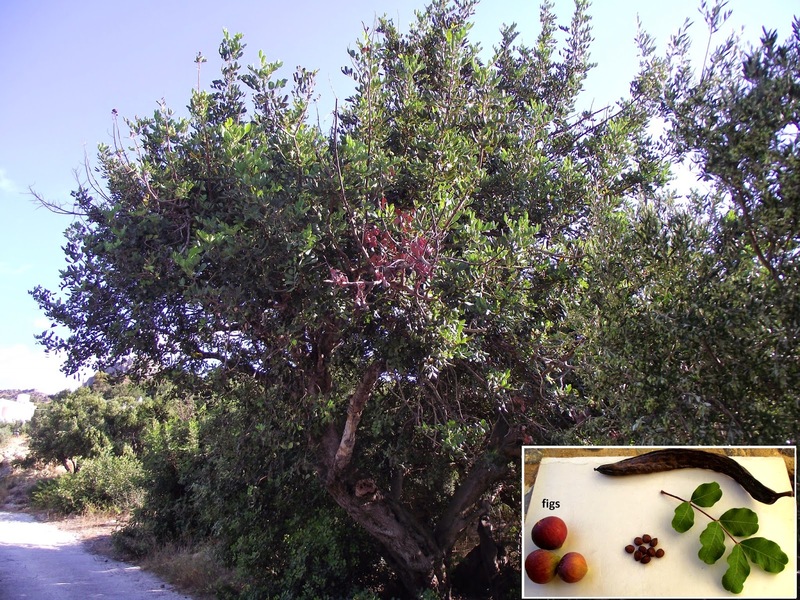 Actually it is a carob tree and the seeds can be used as a chocolate substitute. Here in Crete they make a carob syrup which is used as a natural sweetener. The scientific name of the tree is Ceratonia siliqua and I mention this because the first part of the name (the generic name) is the most probable origin of the word “carat” as in the 105 carat Koh-i-Noor diamond. One carob seed equals one carat and carob seeds (or keratonia in Greek) were traditionally used as a measure for gemstones in the Middle East. The Romans took it one stage further creating a solid gold coin called a solidus which weighed 24 carob seeds and 24 carat gold is still the standard for purity to this day. You know, I was just thinking how few birds we’ve seen this morning and here, sitting up bright and alert on this Lentisc bush is one of my favourite residents. This is the Sardinian Warbler and I often see a pair of them flitting around in the garden. They like to perch on the fence and take small flying insects that are attracted to the fennel plants that grow alongside after which, for dessert as it were, they pop into my pomegranate tree and take the seeds from any of the fruit that have split open. Wonderful little birds with a call like a machine gun. Still, you can’t have everything I suppose. Until next week then – happy hunting. I’m off to enjoy my figs.